Shruti's Blog: What a teasel! Spiny and bitter, strange green hedgehog like, wild, rare and not easily and widely available, not very well known nor popular, yet - very pricey, almost haughty! Is this some sort of a mythical being? A hairy fairy – a leprechaun? Well almost! It’s the magical Kantola, Kartula or Teasel/Spiny Gourd! 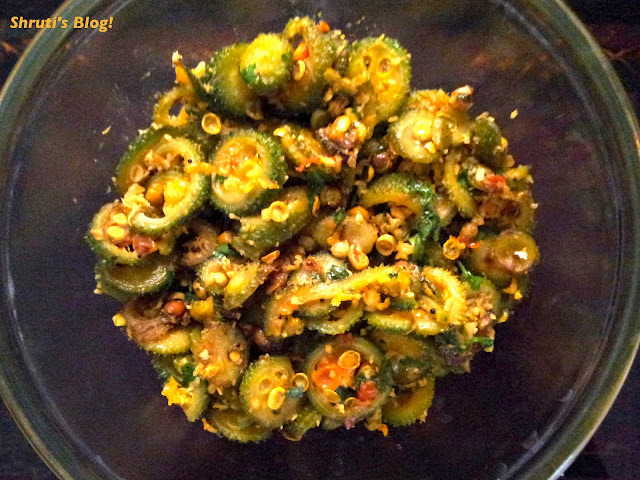 I had the much longed for opportunity to relish this much-craved vegetable after years! Of course, in between lay the innumerable sorry attempts at buying umpteen packs of different brands of the frozen variety in Ozland and the ever- optimistic methods deployed to prepare the simple bhaji of my dreams out of the soggy contents of the packs. The thick skin and prickly spines add a crunch, while the firm pale flesh is a cheeky chew. The seeds are a good bite if tender, and a bit of a fight when not. The taste is indescribable, if somewhat bitter. Greatly enthused I set out to cook this wonder-veggie! You’d anticipate some elaborate process, but really, the slicing is the only task that requires an effort.